We are called to embrace the Gospel and transform the hearts and minds of the St. Patrick community. That is the mission of St. Patrick Catholic School. SPS continues its long tradition of preparing students, both academically and spiritually, for the world that lies ahead. We invite you to experience firsthand the pride taken in supporting a school like St. Patrick. SPS is a shared environment between parish and school with 464 learners, 36 teachers, over 500 Faith Formation students, hundreds of Outreach program participants, and many more. We rely on the generosity of others for assistance in meeting our mission and providing services to our community. • The Sister Bernarda Bludau Endowment Fund: Opened in 1987 with just over $2,000, we reached the $1,000,000 mark in 2013 through the support of multiple generations of families. 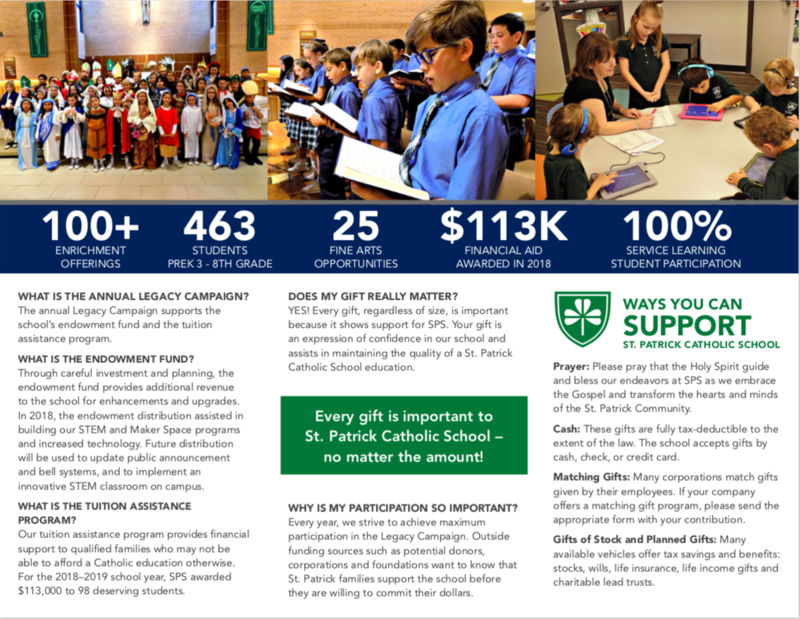 With careful investment and planning, this fund will now provide additional revenue to the school for enhancements and upgrades that can be shared with the entire population of St. Patrick. A contribution to our Endowment Fund is an investment that will grow and give back immediately as well as for years to come. • The Light of Christ Tuition Assistance Program: Sometimes special circumstances, such as economic hardship, can be an obstacle to achieving a quality Catholic education. During difficult times, one thing remains constant, families still demonstrate a strong desire to attend St. Patrick Catholic School. All gifts to the Tuition Assistance Program will be distributed to children who need financial aid in the 2019-2020 school year. We ask that you consider doing something special by making a pledge to support our annual Legacy Campaign. Together, we raised over $130,000 for the endowment fund and the tuition assistance program last year and we hope to grow that number this year to meet our school’s needs. We hope you will make a contribution. Your generosity will make a difference in the lives of many children who otherwise would not benefit from the educational enhancements your gift will afford them. We, at St. Patrick, are preparing for our future and celebrating our faith, our family, and friends like you. Without you, we would not be successful.